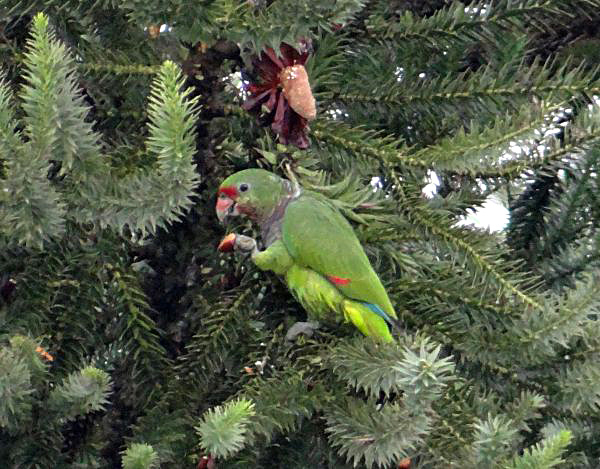 Found in Brazil, Paraguay and Argentina, the Vinaceous-breasted Parrot (Amazona vinacea) is a species of the Atlantic Forest, having a close association with Araucaria forests. Today those are degraded, reduced and fragmented, which is the main cause of the population decline of the parrot. BirdLife International has estimated the upper limit of the total wild population at 2,650 individuals, and places the Vinaceous-breasted Parrot in the category of endangered. The Loro Parque Fundación (LPF) supports various actions for the conservation of this endangered species in Brazil, partnered by the Friends of Environment Association (Associação Amigos do Meio Ambiente – AMA), and in Paraguay by the BirdLife International partner, Guyra Paraguay. To improve the conservation actions, it is important to monitor the populations, and in 2015 the LPF supported a complete census of the species in its three home countries. The field teams counted a total of 3,133 Vinaceous-breasted Parrots, with 2,857 in Brazil, 143 in north-east Argentina and 133 in eastern Paraguay. The predominantly southern distribution in Brazil was confirmed by the number per state, being 1,552 in Santa Catarina, 976 in Paraná, 282 in Rio Grande do Sul, 65 in São Paulo and a mere two in Minas Gerais. 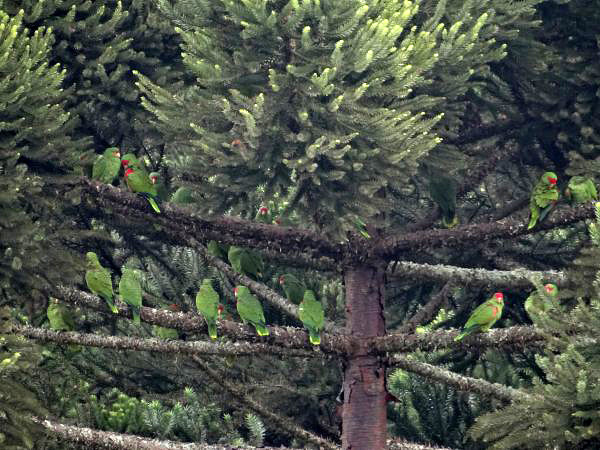 The state of Santa Catarina stands out for sheltering half the world’s population of the Vinaceous-breasted Parrot, which in the eastern portion lives during the autumn and winter alongside many thousands of Red-spectacled Parrots (Amazona pretrei), another species associated with Araucaria forests. Although the result is positive because it exceeds the official estimate of BirdLife International, it is still a very reduced population and the species is still endangered. The total world population of 3,133 is minimum figure because the field teams estimate that they were able to include 80% of all possible individuals. 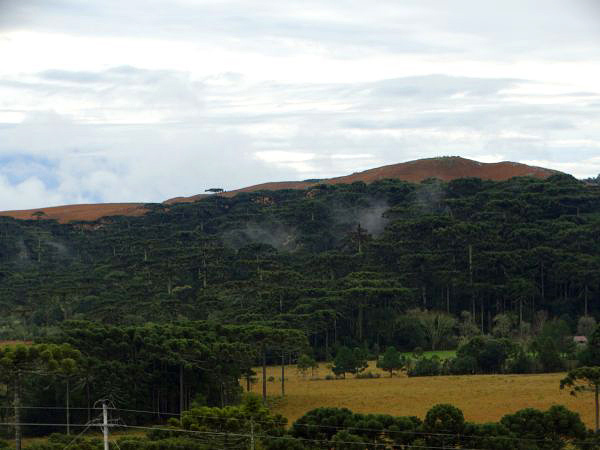 The projects will continue their objective to minimize the negative human pressure on its habitats for breeding and feeding, seeking greater protection of the remaining forests. They will engage landowners, to explain the importance of cavities in old trees and showing that the species depends on them for nesting. 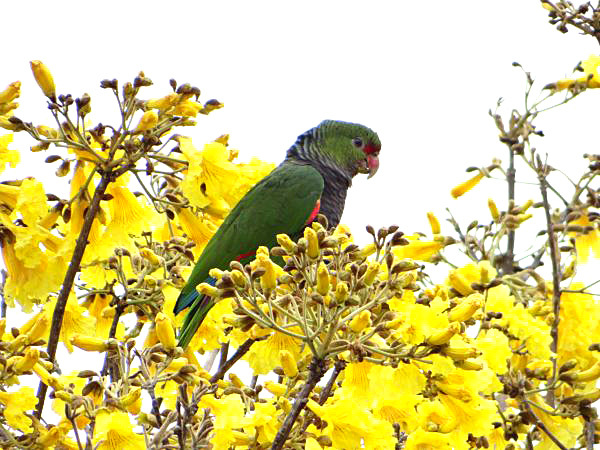 The lack of criteria for the extraction of forest raw materials and management of livestock is a major problem facing the Vinaceous-breasted Parrot today. The lack of sustainable management in the remaining forest fragments leads the landowners to consider native forests as having no role on their properties. As a result the old trees, with cavities in their trunks used by Vinaceous-breasted Parrots and several other species for nesting, are cut and used as firewood. Cattle, goats and horses are given entry to the forest patches, and in a slow but progressive way, grazing combined with trampling prevents the natural regeneration of the forest. In addition to the work with landowners, presentations will be made in the schools of the main regions of occurrence of the parrot, with the distribution of educational materials such as posters and brochures, especially to make people aware of the problems of taking the young parrots from their nests. Title photo: A Vinaceous-breasted Amazon at Iguazu Bird Park, Brazil. (c) Chad Bordes This file is licensed under the Creative Commons Attribution 3.0 Unported license.